My Faith includes my core beliefs as a Christian. I believe in the holy trinity (Father, Son, and Holy Spirit). I believe Jesus is the son of God. He became human, suffered, and died on the cross. Jesus paid for our sins by dying for us on the cross. Jesus conquered death by rising from the dead and ascending into heaven body and spirit. Jesus will one day come again. The foundation of my faith is that I accept Jesus as my personal savior and Lord. He paid for my sins and I will love him eternally. I will follow him all the days of my life. I will live my life trying to be more like him; applying the many lessons he has left for us to my life. My faith can be summarized in that I know Jesus has a perfect plan for me and His plan will prevail! Grounded by this faith (and faced with tribulation) I am filled with Hope. My hope is that I will allow the Holy Spirit to guide me and keep me strong; following the path the Lord has laid out for me. My hope is that I will be cured from this cancer. I hope that I will be with my family for many years. I hope that our Father will teach me to Love my family and friends more with each passing day. I hope that my family will grow in their faith. I hope to one day be a grandfather. I hope that I will learn more about the many lessons that Jesus taught us while on earth and have the opportunity to learn from and with other Christians. I hope to grow more open minded, accepting of other’s beliefs and avoiding judgment of others. Why is Love the greatest of these? I found another article by theologian Mark D. Roberts that seemed to do a great job answering this question. As this article points out, scripture teaches us that God is Love (1 John 4:8). Scripture never says that God is faith or hope. Another point made in this article is that when find ourselves face-to-face with our God in heaven faith and hope will no longer be as important as Love. In the presence of God we will know him and our hopes will all be fulfilled. Love will be everlasting and therefore is the greatest of these. God bless you and keep you forever! I’m sure I played that song for you once, a few years back. 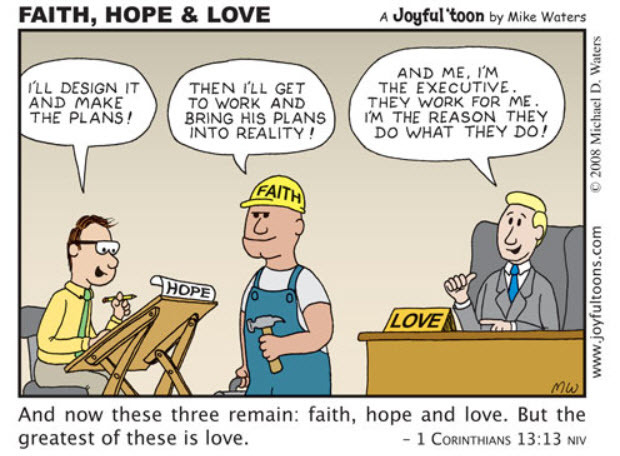 I’ve been thinking about the faith, hope and love question. Faith to me is a mental strength. It keeps your mind ‘in the game’ and helps keep you on a path to accomplishing a goal, or working on a relationship. The greatest for me is certainly Love. Love is the ‘X’ factor. Love has a strength that is impossible to describe. It is pure and intense, soft and comforting. It can transform to anything you need, or need to give. It changes you for giving and receiving it. I feel true, pure love brings out our inner super hero. On a particularly tough day, my son Nic, 4 at the time, looked at me, pulled me down to his face,cupped my cheeks in his little hands and said “I love you mommy” Instantly, everything was better, I felt things would be ok and knew that just feeling that kind of love changed my attitude, my disposition and me.That is the ‘X’ factor!! Thank you for sharing your thinking on this. I still feel like I have more to learn about these powerful forces and how they can work together to make us better people and better Christians. My brother George sent me an email with a very similar perspective to Colette’s. And my sister Mary added that “Love is all about action” and how action speaks volumes about faith, hope, and other things. Tim shared a similar perspective where faith is our beliefs, hope is about thinking focused on the future, and Love is about sacrifice. I really appreciate all this reflection. And I’m feeling that these are all excellent perspectives and they help me to appreciate this as a key lesson to learn. Surely they have a lot to do with who we are as people, Christians, and Citizens. And as we reflect on these as forces that shape us into who we are we will do a better job of leveraging these forces. Dearest Jesus, Thank You for bringing these people into my life. They are helping me to learn the lessons that you have given us in your words. And we know God’s will is revealed through your word. And I ask that you guide us to leverage these forces of Faith, Hope, and Love in your honor, so that we may be better Christians. And we may serve others in your name. And most importantly so we will Love more like you. This I ask in the name of Jesus. I finished this reply and flipped over to a reading plan in the YouVersion app and read the following. Surely, God is already answering my prayer. All, I just re-read this blog and the comments (at thencouragement of a friend). Br far this blog and comments is the most interesting of all. In my 4/26/13 update I talk about three other smaller rumors that may or may not have been prestent in my liver… And the bottom line is that I ended up having a successful liver resection after having been declared inoperable. Modern medicine miracle? Or just plain miracle? Well I believe that our Lord is at work. And I THANK YOU all for the countless prayers you have petitioned on my behalf.